The Dublin satellite town has a large community of Gaelgeoirí so could benefit from new rules. A SPRAWLING SUBURB of Dublin could become Ireland’s newest Gaeltacht area thanks to a bill which will create a new definition of what it is to be an official Irish-speaking region. Labour TD Robert Dowds said that the approval of the draft bill gives Clondalkin a great opportunity to be designated as a Gaeltacht area “at a certain level”. 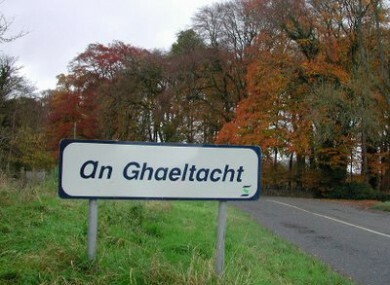 Under the proposed legislation, the Gaeltacht will be based on linguistic criteria instead of on geographic areas. During last year’s presidential election, Michael D Higgins said that Clondalkin had a case to be recognised due to the number of Irish speakers living there. Joe MacSuibhne has been principal of the local Irish-speaking secondary school Coláiste Chillian for the past eight years and strongly supports the idea of designating Clondalkin as a Gaeltacht area. “We have been looking for something like this for years. Currently, there are about 1,500 students receiving their education through Irish in the area and are, therefore, fluent in the language,” he told TheJournal.ie this morning. Language planning at community level will also be central to the new definition of the Gaeltacht. As well as MacSuibhne’s school, Clondalkin boasts two all-Irish primary schools, Áras Chrónáin Irish Cultural Centre and a host of naíonraí (pre-schools). Coláiste Chillian currently serves students from Clondalkin, Rathcoole, Inchicore and Ballyfermot. “There are endless possibilities for the area if it is given the recognition for the number of Irish speakers here,” added MacSuibhne who has been teaching in Clondalkin for more than 20 years. Even simple ideas around language development could create employment for students when they graduate, according to MacSuibhne. The decision to prioritise the drafting of the bill was welcomed by Minister of State for Gaeltacht Affairs Dinny McGinley yesterday. The bill will also make amendments to the role and functions of Údarás na Gaeltachta. Gaeltacht areas are currently restricted to parts of Donegal, Mayo, Galway, Kerry, Cork, Waterford and two small villages in Meath. Email “Clondalkin could be Dublin's first official Gaeltacht”. Feedback on “Clondalkin could be Dublin's first official Gaeltacht”.